The oceanic Posidonia is an endemic plant in the Mediterranean with roots, stalk, leaves and fruit that lives under water between the surface and a maximum depth of some 40 metres. 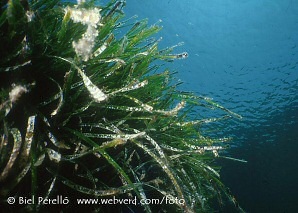 The plant forms prairies of Posidonia, called also, seaweed fields, although they are not formed by seaweed, that are the most important ecosystem of the Mediterranean, equivalent to the forests of the land ecosystems. It is thought that in the Balearics and Pitiüses, there are some 750 km2 of prairies of Posidonia situated on the sandy seabed and rarely on rocky beds, that supply great quantities of oxygen and organic material, contributing, also, to the balance of sediment on forming barrier reefs that maintain the coastal stability and protect the beaches from erosion. The fields of Posidonia are also a great source of biodiversity as they are the habitat of numerous vegetable and animal species, some of which are in danger of extinction. The oceanic Posidonia has an annual growth cycle and the dead leaves, sometimes in the form of a ball, are deposited on the beaches, protecting it from the erosion caused by the waves. The seaweed fields of the Balearics are spread around many places. The main concentrations are in Ses Salines in Eivissa and Formentera, south of Formentera, Sant Antoni de Portmany in Eivissa, south of Menorca, the bays of Alcúdia, Palma and Pollença on Mallorca, and Cabrera. Although the scientific community has recognised their importance to maintain the quality of the coastal waters and to form and preserve the beaches, the seaweed beds are threatened, amongst other causes because of the uncontrolled rubbish that contaminates the water, the construction of ports, quays and dikes that originate changes in the marine currents, the regeneration of beaches with extraction of sand from the bed of the sea, illegal trawling fishing, non regulated anchoring of boats and the introduction of exotic species such as the Caulerpa taxifolia. Finally, we stress that in 1993 the Unesco declared Menorca a Reserve of the Biosphere because of the important archaeological and natural heritage it preserves, amongst which are the important seaweed fields. At the same time, the fields of Posidonia of the Natural Park of ses Salines in the south of Menorca and north of Formentera, together with other monumental places on Eivissa, such as the fortified Dalt Vila, the cemetery of the Puig des Molins and the Phoenician settlement of sa Caleta, were declared in 1999 World Heritage by Unesco.